A new craze has been sweeping my creative outlet lately. 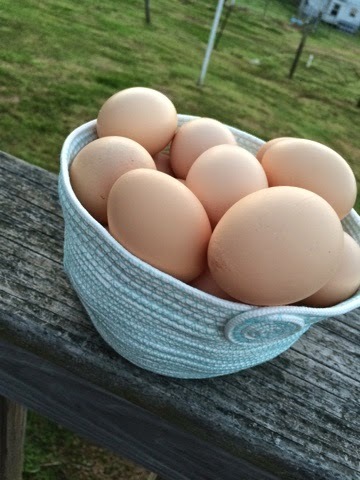 Basket making. Without any real knowledge or know-how, I dove in head first. I asked my husband to go by the hardware store and buy me some clothesline rope. He brought me home a few packages. 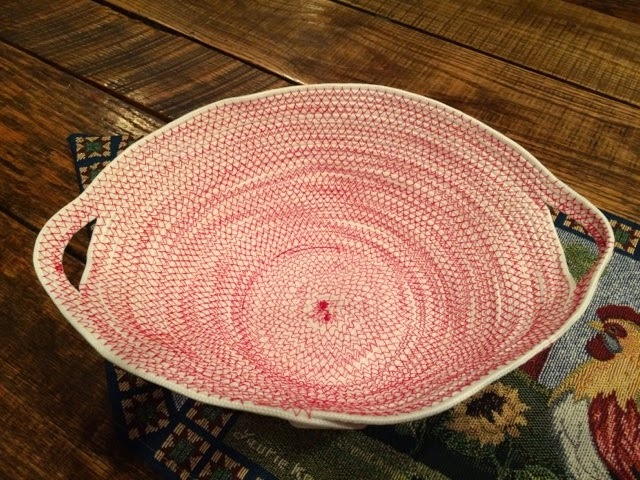 It was what I used to make my first two baskets. The aqua and red. Then I was at another store and found some thicker clothesline rope and got some to try also. Different feels and different strengths, but I like how all of them turned out. I can't give you a tutorial on how to make a perfect basket, but I can tell you that I took the clothesline rope. 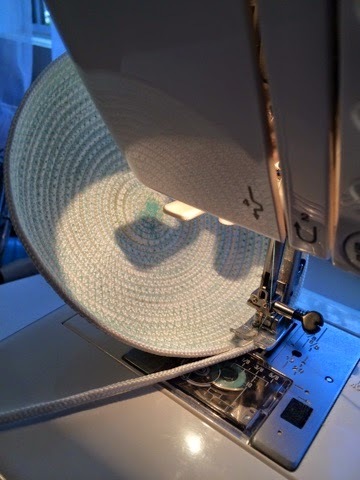 I started coiling it around and around and zigzag stitching around each coil. It began to take a form of its own and it was a very neat project to see unfold. I had no idea where any of them were going as I was sewing... I just let it take shape. 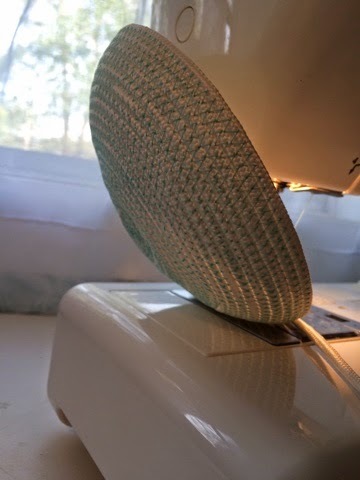 You can make the bottom begin to curve up by adjusting the basket slightly so you can begin the 'sides'. You will start seeing more of a bowl shape before long. It's not perfect. The zigzags overlap and go a little wonky at times. But... I just love it! My next basket... 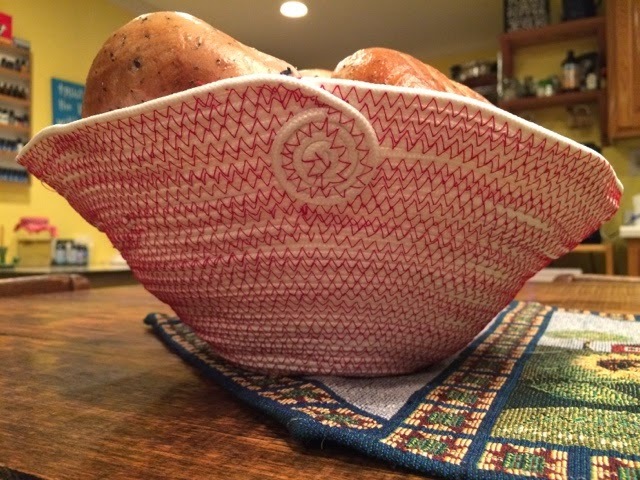 I hope will have handles, like a market basket. I am going to need a LOT of thread for that one. Haha! Until then, friends... Have a great day! Chas, these are fabulous! I love that the zigzags are askew and such. The imperfections add beautifully whimsical character. I love them. 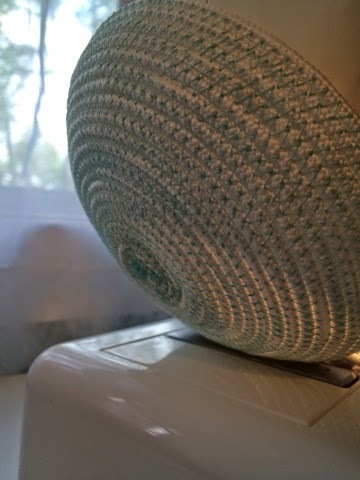 If I understand right, the thread color you choose, dictates the color of the basket! I enjoy seeing your creative juices, flow. Thank you, Mrs. Mo! Yep... the rope is just a natural color so with the thread, it helps make the basket looked like it is colored by whatever thread you choose. It's really neat! Thank you so much, Carolyn! 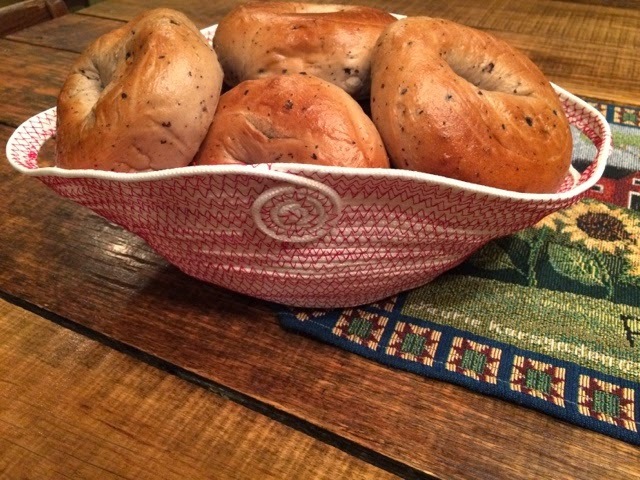 I sure hope that these will be a joy for you to make and love! I pray your mobility problems will greatly improve. 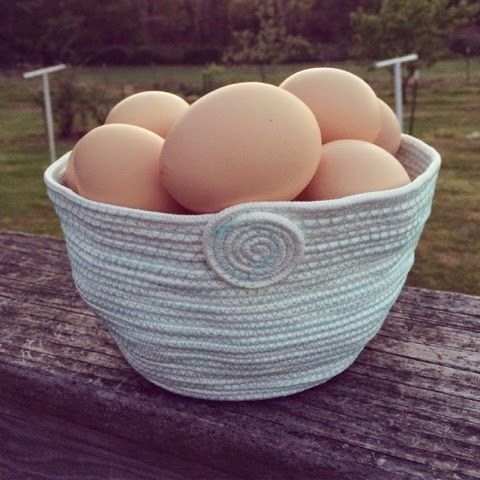 Just found your blog and instagram...wonderful crafts that you make! 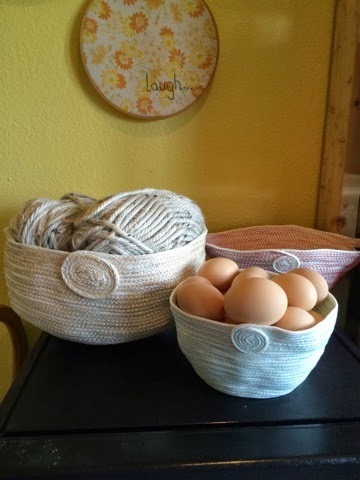 I saw on Homespunliving blog that Deb posted a tutorial for the rope baskets, maybe this will help. 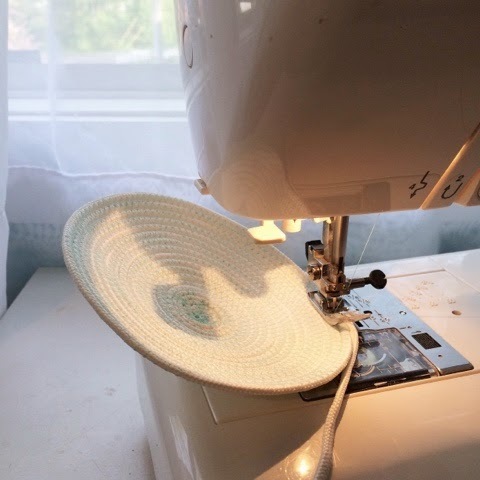 http://weallsew.com/2013/06/06/coiled-rope-basket-by-juliette-lanvers-for-weallsew. Thank you so much for that link! Deb from homespun living is a favorite blogger of mine, so YAY! :) I really appreciate your sweet words and your visit! Thanks again! 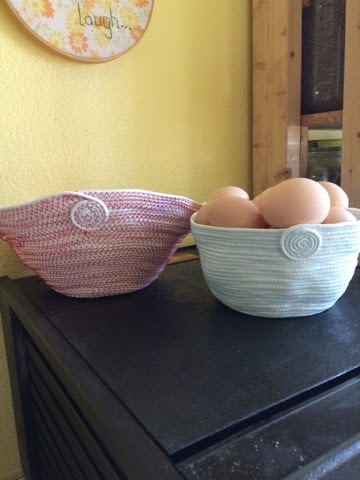 What great baskets. They are so unique. Love them.